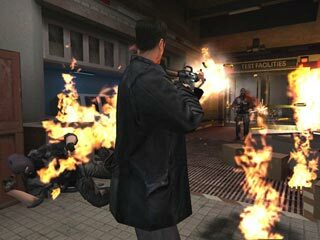 Max Payne: "Bringin' the Payne"
Remedy Entertainment has raised the bar on the FPS (first person, shoot-em up) industry. Sure, I like chasing monsters and creatures from other worlds, but what about monsters in human form. Remedy, like everyone else in the FPS industry, has introduced its own new graphics engine. The difference� gamers have been given a beefed up graphics engine that rivals those of Quake 3 Arena and Unreal Tournament. 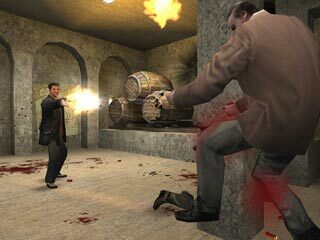 The graphics used in the Max Payne are stunning. Before game play, one would think that the background graphics would be a bit cartoonish, no so. All graphics are as life like as you can get with the current technology. There are actual photographed faces mapped to the characters. I argue that graphics alone do not make a game. There should be something to keep you coming back. The story behind Max Payne has been crafted to keep you glued to your seat. Gamers navigate their way through the game rather quickly as a result of master-crafted story line. The unsolved murder of your wife and kid, New York drug-lords, Russian Mafia, crooked business owners, a satanic madman, an armory of weapons, and some serious sarcasm can only leave you screaming for more. Drama! The developers could have left out two levels that are referred to as "blood mazes." Real waste of time there. It's almost enough to make you get up from the computer. Who knows, maybe that's the plan. Thankfully those two levels are very short. With the sour comes the sweet. Most FPS gamers are big action movie fans, go figure. Remedy has given us a way to get out of the heat. BULLET TIME. In a word, Awesome. You too can be like Neo and dodge bullets. Everything slows down to give you a second to get your thoughts together and your shots off. As a bonus, raising that bar even more, Remedy Entertainment has decided to include the actual level editor that was used in game development. I can't think of anyone else that is proud enough of their product to make such a bold statement. New graphics engine, refreshing game presentation, realistic characters, and a level editor. A security guard once told me, "Break leather, let the lead fly and land where it may." I can only imagine that was the mentality of Remedy Entertainment as they released this title. Max Payne is available now at Gameport for $39.50!